It’s becoming pretty clear how Republicans plan to defend their budget. They’re going to lie about it. The Ryan plan doesn't cut Medicare. Actually, it increases funding in it. And the only people in this town that have voted to cut Medicare are the people that supported Obamacare, that cut half a trillion dollars over the next 10 years out of Medicare and is using it to fund a healthcare experiment somewhere outside of Medicare. The only people in this town that have voted to cut Medicare spending are the people who voted in favor of Obamacare. That's a fact. And so the truth is the people. Sigh. This is pretty much the opposite of the truth. Yes, the Affordable Care Act reduces spending on Medicare. But it does so gradually, by establishing a long-term goal of allowing the program to grow at the same rate of gross domestic product plus one additional percentage points--that is, GDP+1. And it’s a goal in the truest sense of the word. If the program’s starts growing at a faster pace, there are mechanisms to slow it down but not necessarily to get it all the way back to GDP+1. The Republican budget, by contrast, would hold the cost growth of Medicare to the consumer price index, or CPI. CPI grows considerably slower than GDP, let alone GDP+1, so that's no small thing. The Republican budget would also enforce this target rigidly, by handing seniors vouchers whose value is set by a fixed, pre-determined formula. At the same time, the Republican budget would dramatically reduce the federal investment in Medicaid, on which so many of the elderly rely for supplemental coverage and/or long-term care, particularly nursing homes. Overall, according to the Congressional Budget Office, the difference between the two plans goes from about 1 percentage point of GDP in 2022 to between 7 and 9 percentage points of GDP by 2050. That’s quite a difference. And it's not the only one. The cuts in the Affordable Care Act hit the providers and producers of health care more than the consumers, at least directly, and include changes to the delivery of medical care that will, with any luck, make it possible for people to get better, more efficient health care even as it costs less. The Republican budget actually includes most of these same cuts for the first ten years, but then puts almost the entire onus for cost-cutting on individual beneficiaries via the vouchers. 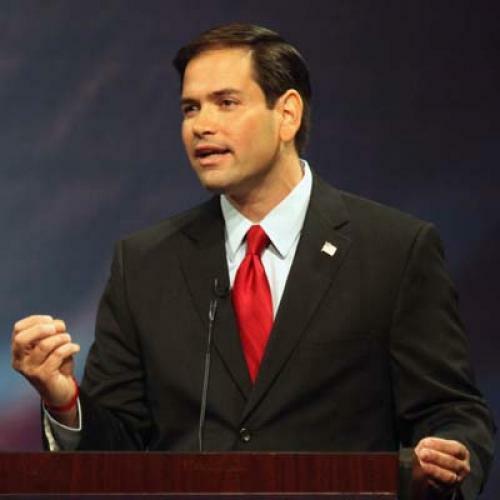 Do Rubio and his colleagues care that they are completely distorting reality? Do they even realize it? Your guess is as good as mine. And quite possibly theirs. *Speaking of McCaughey, The Hill's Julian Pecquet had the good sense to call Michael Chernew, one of the researchers McCaughey has been citing in her defense. Chernew gave a detailed explanation of the ways in which McCaughey was misinterpreting their research. When asked by Pecquet to respond, McCaughey said "I suggest that you read his study rather than getting his take on it. He may be embarrassed that he wrote something that now doesn't support the president. ... I've read his study, I've read it carefully and … I believe that I'm on very firm ground." Chernew, a Harvard economist, is one of the nation's most respected researchers on Medicare. I'll leave it to readers to decide who has more credibility when it comes to describing his own work.